Stuffed squids are one of the stars of Dalmatian cuisine. I find it a bit challenging to depict you this dish and its rich flavor in a way that would do it justice. As usually, it’s easier for me to prepare the dish and write down the recipe. The process of preparing the dish brings up the feelings of excitement each and every time and if I already prepared a certain plate many times, the recipe flows in effortlessly. What comes harder, though, is finding the right way to transmit my love and excitement about the particular plate using just words in order to wake up your senses as well and inspire you to give a try at preparing it. The best season for going squid hunting is between the end of October and March. That’s the time when the sea here cools down and the squids that spent the summer hiding in the far-off depths come closer to the coast and islands, searching for food. We say that squids are “night hunters”, that’s why you go squid hunting in the sunset and stay until early morning, usually using so called “peškafondo” – which is a coloured fish-looking piece that attracts squids. When it comes to stuffing the squids, there’s no limits to creations and imagination. You can stuff them with spinach, shrimps, onion, rice or the combination of few different ingredients. I experimented with many of them to finally come back to the oldest and simplest of the mixtures: squid tentacles mixed with garlic, parsley and olive oil. 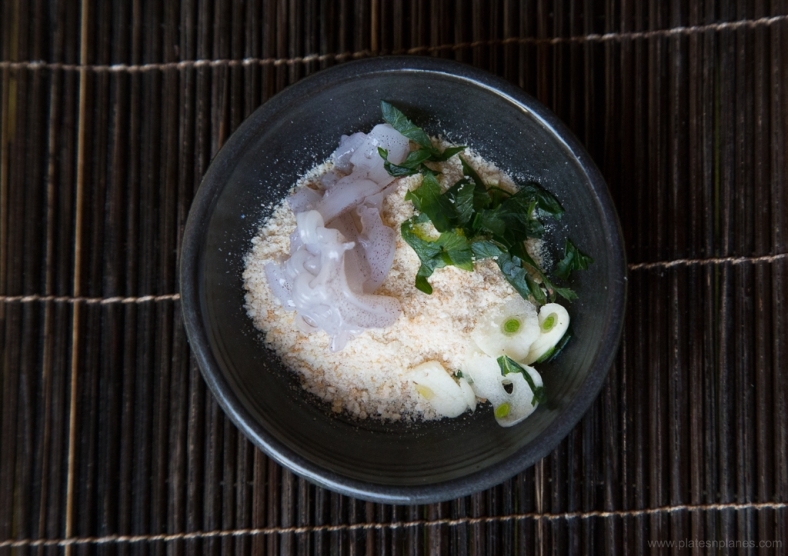 These four ingredients perfectly enhance and add to the natural, mild squid taste. In just one bite you can feel all of the the flavors of the Mediterranean: sea, sun and salt. I am sure this dish will activate and please all of your senses! When stuffed in this manner, we can bake the squids either in the oven or on the grill. My favourite way to preapare them is in the rich tomato sauce, red wine and Prošek(Dalamtian desert wine) – the mixture that will put your taste buds on fire! The recipe for the stuffed squids dates back to the 18th century and the island of Hvar, in the period of La Serenissima, when Dalmatia was still under the dominion of the Republic of Venice. All the time and space travelling just added up to its taste and now it is considered one of the gems of Dalmatian cuisine. 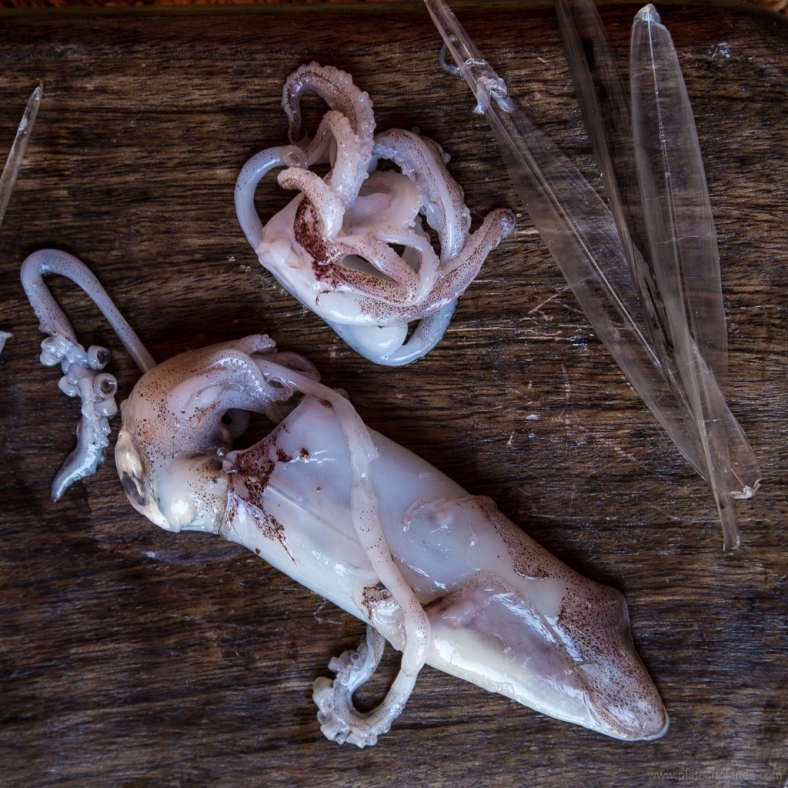 Clean the squids and remove the inner bone and the insides, separating the tentacles. Chop the tentacles into small pieces. Make the mixture out of chopped tentacles, onion, parsley, crumbs, olive oil and pepper. Stuff the squids with the mixture and close them with a toothpick (the remaning mixture can be added to the sauce at the same time when squids are dived into it). Heat the olive oil in a pan or a wok and add garlic and onion, continuing to stir until onion softens. Add tomato sauce, parsley and continue to stir at the low temperature for 5-10 minutes. Place the stuffed squids in the sauce and cook for 20minutes, gradually adding wine and Prošek. They can be accompanied with polenta, cooked potatoes or wide noodles. If served with polenta, the dish gets a wonderful visual appearance thanks to the vivid yellow colour of polenta and deep red colour of the sauce.